Different materials have been used to "fill" cavities in teeth. 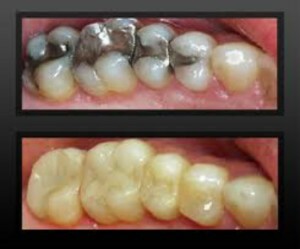 There are two commonly used materials for filling teeth today, silver amalgam and composite resin. While silver fillings have been the standard material of choice for many years,they can look unsightly and do have some potential medical concerns.SILVER FILLINGS:-These are mainly an alloy of silver, tin and mercury. This mercury present in the filling has a high level of toxicity as it releases mercuric vapors from the fillings, thus posing a health hazard to the patient over a period of years.